"M. Bizet, as is known, belongs to that new sect that believes in vaporizing musical ideas instead of enclosing them within definite bounds. For this school of composition, of which Wagner is the high-priest, ... motif is old-fashioned, melody is superannuated; the voice is overpowered by the orchestra, leaving only a feeble echo. Such a way of composing must inevitably produce works that are confused. It is melody that is the design of music. If one takes that away, only educated noise is left.... Orchestration plays an important role in Bizet's music. It is full of learned combinations, delicate embellishments, and rare and unexpected sonorities. But the excessive struggling of voices against instruments is one of the faults of the modern school. 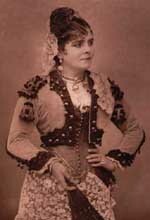 The role of Carmen is not a success for Mme Galli-Marié. She is trivial and brutal; she turns this feline girl into a cynical harlot." "After a second hearing, after becoming more accustomed to the style of the score, I saw the real qualities of the work, qualities that become apparent only when one listens for them. Played through on the piano, this work may be more appreciated than hearing it first time on-stage." "Sadly, what is dramatic in a novel is not always so in the theater. Certain types of character that are intriguing in a book are less appealing on the stage, where they take on a realistic nature that shocks even less timorous spirits. The two heroes of Mérimée's novella, a fallen woman and a deserter, cannot be transported to the theater with impunity. The love between these two odious beings was little suited to inspire a composer as poetic as M. Bizet. He failed to strike a really sympathetic tone, except in the first duet, while the character of Don José is not well-defined. There is, nonetheless, huge talent in this musical score. The music follows the various twists of fortune of the drama with rare theatrical intelligence, and there are clever details of harmony and instrumentation in abundance. There is perhaps too great a striving after originality, which sometimes borders on the bizarre. There are too many chromatic alterations, and these disorient even an ear accustomed to the audacities of the modern school." "[It is not] with ingenious orchestral effects, with chancy dissonances, with instrumental artifices, that one can best express in musical terms the uterine furies of Mlle Carmen and the lustings of the ribald crowd that throngs around her. ... M. Bizet, who has nothing left to learn of what those who have taught him, still has lamentably a great deal left to learn from those who have not taught him. His heart, rather cloyed by the school of dissonance, and all his heavy learning, needs to rediscover for itself a musical virginity." "The stage [in general] is given over more and more to women of dubious morals. It is from this class that people like to recruit the heroines of our dramas, our comedies, and now even our comic operas. But once they have sunk to the sewers of society they have to do so again and again; it is from down there that they have to choose their models. ... They think they always have to "improve" on what has gone before. Marion Delorme, Manon Lescaut, Marguerite Gautier, steps along this sorry path, are now past and gone ... Carmen is the daughter [of these] in the most revolting sense of the word ... the veritable prostitute of the gutter and the street-corner." "This distinguished artist could have corrected that aspect of the Bohemian character [Carmen], heartless, lawless, devoid of honor, that was portrayed as shocking and repugnant on stage. On the contrary, she exaggerated Carmen's vices by means of a degree of realism that would be barely acceptable in operetta, in a small theater. 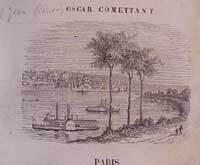 In the Opéra-Comique, a subsidized theater, an honest theater, Mlle Carmen ought to have restrained her passionate feelings." "The duet begins passionately. Carmen is an uncultivated being, a wild animal, who lacks neither directness nor courage. She charges right into the danger.... Don José is taken aback.... At first, the wretched man tries to extricate himself with supplications. His pain, his distress awaken only her scorn. Enraged, the gypsy-girl flaunts him by hurling his ring in his face. Now he turns back, foams with rage and kills her to stop her running off to her Torero. This whole mighty number, filling almost an entire Act, is wrought with the very greatest skill. One feels moved, torn apart. The grief of this unfortunate man, Carmen's unyielding stance in face of the despair that she provokes, her indifference ... And immediately after this, the tragic moment of contrast between the blood-spattered agony, which is enacted at the front of the stage, and the triumphant fanfares, which ring out at the back: all the tumult, all the gradations of feeling, are so perfectly developed that they leave no doubt as to the dramatic future of the composer. We must declare that the performance contributed powerfully to the success. "I won't mince words. Your Carmen is a flop, a disaster! It will never play more than twenty times. The music goes on and on. It never stops. There's not even time to applaud. That's not music! And your play – – that's not a play! A man meets a woman. He finds her pretty. That's the first act. He loves her, she loves him. That's the second act. She doesn't love him anymore. That's the third act. He kills her. That's the fourth! And you call that a play? It's a crime, do you hear me, a crime!"